Welcome to Casa de Balboa! Thank you to our still growing number of repeat guests. We appreciate that you have made us your beach vacation home for the last 17 years and promise to continue our noted service for many more years to come! Because we own some and manage other premium properties we keep our properties extremely reasonably priced considering the quality, décor, amenities, location, and views. In addition, we provide the linens saving you more money. We charge the minimum for cleaning and have better quality control. We realize that this is your vacation and often times a special event whether it be parents of a bride and groom needing a special “home away from home”, a 50th Wedding Anniversary family reunion, or simply the beach vacation you’ve been dreaming about…we’ve got you covered. We are here to answer any questions and always have “boots” on the ground to help if needed. Casa de Balboa is perfectly located (shops and restaurants are plentiful and close by..no need to drive) in a quiet family area with the best views in Newport Beach. We front the largest bay beach in Newport Beach. It is now part of the 9 1/2 acre Marina Park, with state of the art children's play area including a light house squiggly slide onto the matted play area. The Light House Cafe is located there as well. They serve breakfast, lunch, and dinner. Directly next to our properties the street ends with a small dock for fishing and picking up/dropping off boat passengers. The water and sand are 30 feet away! Many guests monitor their sleeping infant while sunning on the shore! If standing in front you can see both bay and ocean lifeguard stands. The ocean water is the closest to the boardwalk where we are located and is accessed using the crosswalk. Our lots are not typical beach lots. They are on 40, 45, and 50 foot wide lots (most lots are 25 or 30 feet wide) so you don't have that "bowling alley" feel..in addition it gives you significantly more outdoor space with front bay/beach facing courtyards and rear courtyards for our two bedrooms and large decks for our three bedrooms. As we are situated on a turning basin all the sight-seeing boats, wedding boats, sailboat races, and boat parades (4th of July, and the famous Christmas) turn right in front! There are the most spectacular views day and night of the harbor, the islands, Newport Coast, Fashion Island, and the mountains in back of all that. For those with children, weekly summer programs are held at our beach, such as sailing (UC Irvine runs the program at the park at the end of our beach), kayak, and swimming (Newport Beach has won water quality control awards. Our beach is tested each week). It may be helpful to read our guestbook for each Casa. 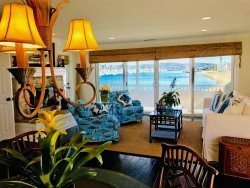 See what our guests say that makes the difference between a rental and a Casa de Balboa Luxury Vacation Rental. Come stay with us and find out why our guests return year after year! **We are NOT affiliated with any properties that are not listed on our site. Please be wary of other properties that try to represent themselves as being affiliated with Casa de Balboa, the premier vacation rental property in Newport Beach.